It’s been a while since we last saw Rachel Bilson on the red carpet, but she made a welcome return at the 2013 Art of Elysium ‘Heaven’ Gala held at 2nd Street Tunnel in California last night. Adored more for her street style than her red carpet style, she delights in this Valentino Resort 2013 gown. The vibrant pink animal print long-sleeve gown was statement enough, so the actress didn’t add any trinkets, just a glossy pink lip colour. What I love most about this look, aside from the colour and print, is that it’s so unexpected. I would wear this in a heartbeat, but I would’ve assumed Rachel to have opted for the floral cutesy dresses showcased in this collection. 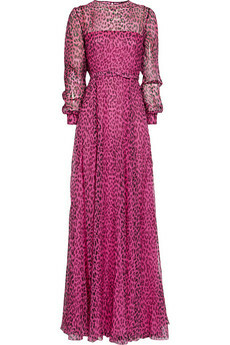 You can buy Rachel’s Valentino gown from Net-A-Porter.com.